Re4m's founder, Heather, graduated from the Industrial Design program at Carleton University in 2014. Eager to start her career, she applied to every design company she could think of. To not much a surprise, Heather fell shorthanded of a new job. Frustrated at the system, she switched gears and started following one of her passions; taking discarded materials and giving it a new life. Heather worked at a local ottawa retail store upon graduating and she noticed that they were tossing old displays into the bin. When she asked why would you send perfectly fine but outdated displays into the trash, the company responded by saying "It was just easier this way". That's when Heather realized there could be a great opportunity to reduce the amount of commercial "waste" headed to Ottawa's landfills. As a hobby and a side gig to earn extra cash, Heather up-cycled eight of these old displays into fabulous light fixtures and sold the finished products on Etsy. And so it begins! This would be the first product that Heather made under Re4m (shown below). Before selling the light fixtures, Heather was using a small cellar space under our apartment for storage of the items and a small work bench. The space, nicknamed “The dungeon”, was becoming an issue. There was little space and after a rainfall it smelled like wet dog. It was time for an upgrade. Using the profits from the light fixtures, Heather was able to purchase her first ever workshop in May 2015. An old 20' shipping container (or sea can) was sitting in her neighbours side lot, how fitting! 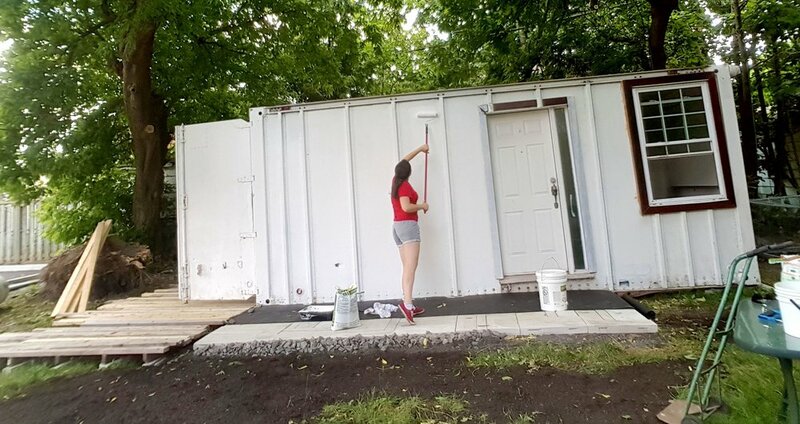 Repurpose the shipping container into a workshop she thought, so she struck a deal with him. Yes, it was like a dream compared to the dungeon but the winter proved to be pretty rough. Now, a couple years later, Re4m is growing! We are diving deeper into re-thinking the way we dispose of commercial and retail "waste". By converting reclaimed materials into storefronts, furnishings and displays, we can offer companies an authentic and sustainable option to refresh their space which puts our clients in a feel-good mindset. Now we are working on growing our list of reclaimed material suppliers. We currently are working with coffee roasteries, music stores, bike shops, cafés, construction companies, sign shops, trade show booth companies, plastic suppliers, a museum, and various retail stores. We acquired a bigger shop in Little Italy in 2017 which Re4m grew out of in a year! Re4m is looking forward to expanding in our new location off of Billings avenue in Alta Vista. Love our back story? Want to have a lasting, sustainable relationship with us? Re4m offers obligation free consultations on how commercial and industrial businesses can re-think how they handle their waste. We also provide limited complimentary design consultations for your space. We are continually seeking out businesses to support not only us, but our city!